As I read the cover story in the April, 2013 issue of Chess Life about GM Hikaru Nakamura, I reflected back on the young boy I met many years ago. He certainly has come a long way. I would like to tell you about an incident that took place at the 2010 US Open in Irvine, CA where I was hosting the GM Arnold Denker Tournament of High School Champions. I had decided to have a simultaneous exhibition prior to the competition and invited seven of the Denker representatives to each play six young, area students. The room was set up so I checked registration to see if all of the young players were seated correctly and my Denker participants were ready. I noticed an empty student chair at the simul area reserved for those players who would face IM Steven Zierk. I was surprised because I had spoken to all of the participants in advance and now one player was missing. I started the simul and after a couple of moves US Champion GM Hikaru Nakamura came down the hall. I thought it would be great to introduce him to the assembled parents, coaches, Denker representatives and student participants. Tony Rich of the Chess Club and Scholastic Center of St. Louis came up to me and offered the following idea: How about we see if we can place Hikaru at the empty chair opposite Steven and see how long it takes for Steven to realize that he is not playing your average “kid”. Tony persuaded Hikaru to participate in this prank. We mentioned to him that he needed to look down and not show his face. There was a chance this would work because most of Steven’s opponents were high school students. When Steven was at the end of his group ready to start another round of moves, we had Hikaru move quickly into place. As Steven approached Hikaru’s board he recognized the chair was filled and reached out to shake hands with his opponent. As Steven raised his head he immediately realized who his opponent was. His startled reaction caused him to jump back as they were shaking hands. 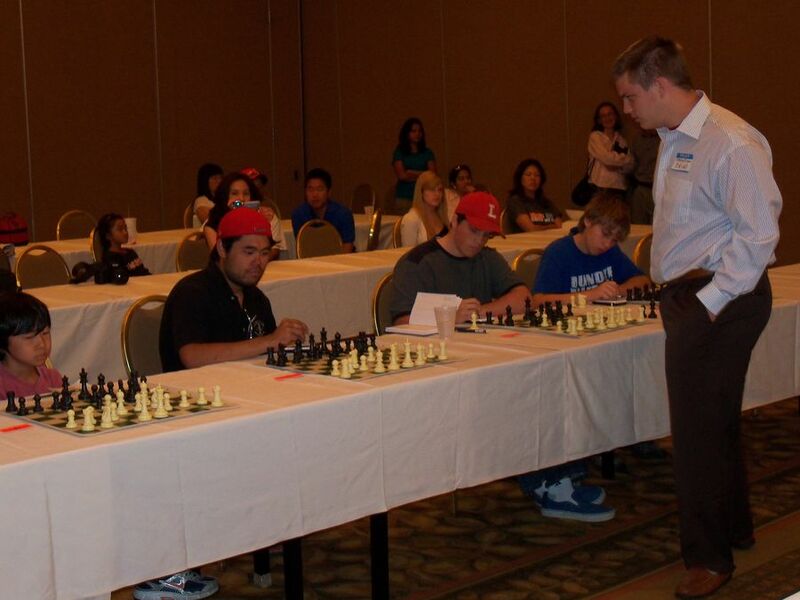 After several moves, I stopped the entire simul and addressed the “young man” playing against Steven. “Excuse me, but you look a little older than the other participants?” He nodded his head and then I asked, “Have you played in high school before?” He replied, “Yes.” At that point I introduced Hikaru to the audience and there was a huge round of applause. I asked everyone to continue, expecting Hikaru to step away from the board and depart the room. He continued for a few more moves and then shook hands with Steven and stepped to the edge of the room.